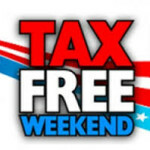 In 2018, the Missouri Tax Free Weekend 2018 three-day holiday begins at 12:01 a.m. on Friday, Aug. 3, and runs through Sunday, Aug. 5, 2018. Certain back-to-school purchases, such as clothing, school supplies, computers, and other items as defined by the statute, are exempt from sales tax for this time period only. Missouri Sales Tax Holiday 2018. Any article of clothing, including footwear, with a taxable value of $100 or less. This does not include accessories such as jewelry or handbags. The holiday lasts from 12:01 a.m. on Friday through midnight on Sunday. Not all local cities are participating, including Brentwood, Clayton, Des Peres, Frontenac, Kirkwood, Ladue, Maplewood, Richmond Heights, University City, and Webster Groves. You cannot put items on layaway during the weekend and pay for it later tax-free. You have to pay for the items during the tax-free holiday to get the exemption. You can shop for tax-free items at both St. Louis Premium Outlets and Taubman Prestige Outlets in Chesterfield. Taubman Prestige Outlets will also feature live music and entertainment throughout the weekend. If a customer purchases an eligible item during a sales tax holiday, but later exchanges the item for another eligible item of equal or less value, no tax is due even if the exchange is made after the sales tax holiday. Items purchased over the Internet from Missouri businesses during the tax-free weekend qualify, even if delivery occurs after the holiday. You do not need to be a Missouri resident to purchase tax-exempt items. Retailers with less than two percent of their merchandise included in the tax-free holiday do not have to participate, so to save yourself a trip, call places you plan to shop ahead of time to make sure they are participating. The tax holiday qualifies for personal-use items only, so, for example, you cannot buy computers for your business during the holiday. For more information, visit the Missouri Department of Revenue’s website. More Missouri Sales Tax Holiday 2018.